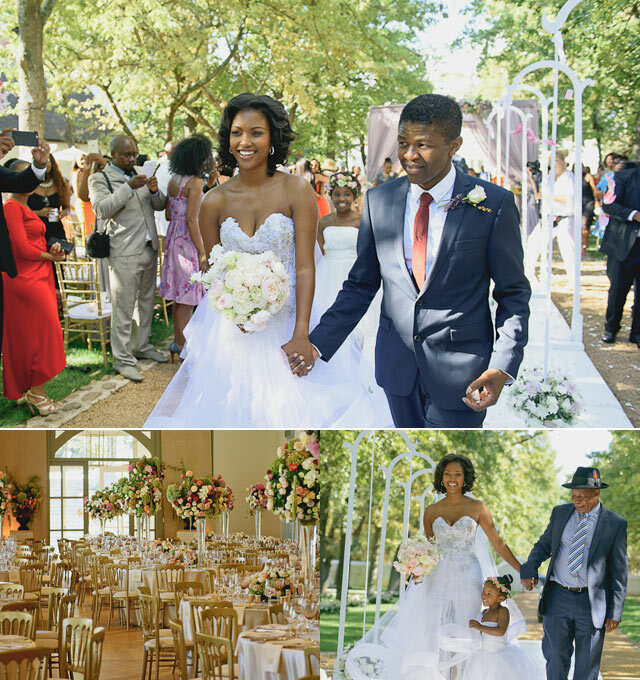 Businessman Lunga Ngwana weds the gorgeous model Rosette Mogomotsi in a magical floral winelands wedding. A casual meeting with mutual friends led to a blossoming romance between model Rosette Mogomotsi and businessman Lunga Ncwana. The couple decided that Human Right's day on the 21st of March would be their perfect day to say I do in front of 250 guests on a wine estate near Franschhoek. The bride had already chosen her wedding dress long before a date was set and Johan Botha (Co-owner & Designer, F Wilson Fashion Design) informs us about the versatility of this completely unique, custom-made dress made with deconstructed material. This is the first wedding to be held at this 350-year-old estate after extensive renovations and Christina Holt (Owner, Wedding Concepts) made quite a show of it. With a six tier cake and faux floral wall, guests at this exquisite event were in for a memorable event. Guests numbered Ministers, veterans of the liberation movement and fellow businessmen. Join us for this wedding the groom describes as "the best day" of his life, Thursday at 7:30pm on SABC3.